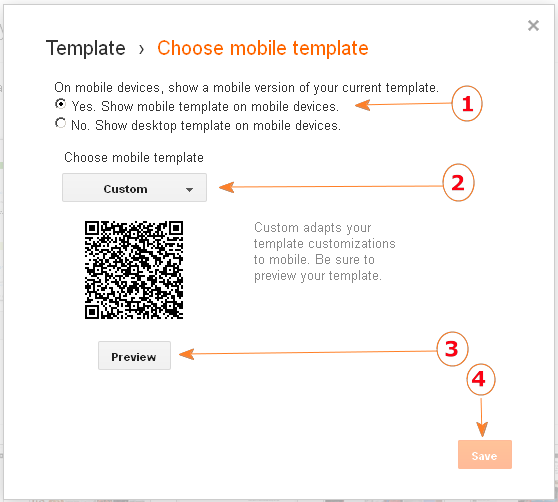 Have you enabled the mobile template for your Blogger blog yet? If not, you need to do it right now ! A recent Nielsen report shows that people’ time spending on mobile web (including mobile apps) has increased 63 percent in 2012, compared to the same period last year. Desktop users who accessed Facebook and Blogger decreased 4% and 3%, while the mobile users increased 85% and 100% ! So it's no doubt that the mobile devices helped fuel the continued growth of social media. If you do not have a mobile site for people to access, you miss something big. Then how to make a mobile site for your blog for people to access? It's easy, you can simple enable the Blogger mobile template in a few minutes. Step 1: From the Blogger Dashboard, click on Template, you will see a screen like following screenshot: the left shows the Desktop template for your blog, and the right shows the Mobile Template for your blog. Step 2: You will see a screen like following screenshot. (2) For the "Choose Mobile Template" option, choose "Custom" to use your custom colors/fonts settings, or choose "default" if you want to use Blogger's default setting.Suggest you choose "Custom". (4) click on Save, to save the settings. Replace the http://my-blog.blogspot.com with your blog address. What do you see, is it different from the layout you see on the normal website? If it's different, you have set up properly. Note 2: By default, the mobile site does not display the widgets/ gadgets you added to the blog, it only displays the posts. I will talk about how to display the widgets in mobile template in my next post. Use your smart phone, go to your blog address http://my-blog.blogspot.com directly , do you see the mobile site? Example: My site is showing as at the right. 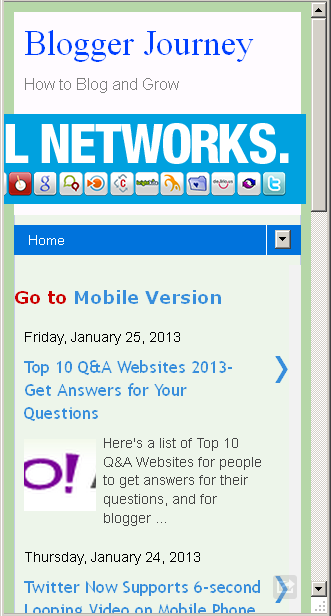 Most of you will see the mobile version, because Blogger redirects mobile users to the mobile site automatically. But some of you may not be able to see the mobile version, because at this moments, Blogger's mobile template does not support all the mobile browsers yet- I will talk about the mobile browsers and a fix for this problem. Anyways, your mobile blog site has already been set up, even if you can't see from your phone, but other people will see from their. By default, Blogegr mobile template does not display widgets/ gadgets that you added to the blog. That means, if you add a new widget to your blog, you will see it on the blog's desktop version, but not the mobile version. If you'd like to display the widgets on the mobile template as well but do not know how to, check out my other post: How to Enable / Display Widgets on Smartphone for Blogger /Blogspot Mobile Site's Mobile Template ? 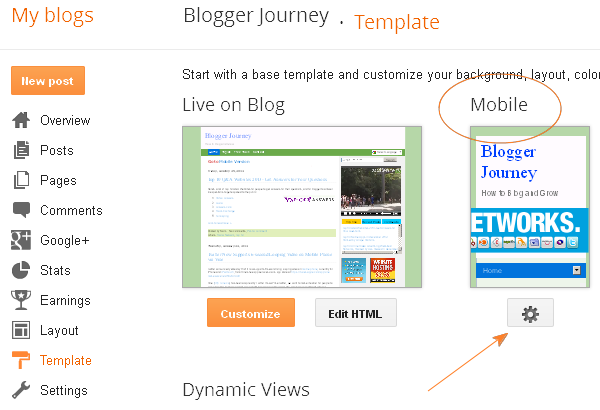 Enable mobile template in Blogger is a great way to satisfy your mobile users, and is easy to set up. I'd like to hear from you of your experience with the mobile template for Blogger, leave a comment below. Excellent write up. I found gold reading your blog content, many things I found here amaze me. Good work! hanks for the blog, great tips and information. 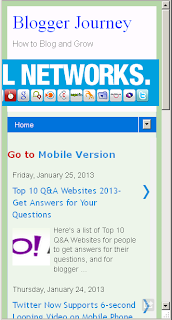 Thanks for sharing with us these great tools to create free mobile version of website…. Wonderful color combination your blog collection have.